Add a distinct and noticeable fashion accent to your look with this 9ct White Gold ring, made in a halo style in cubic zirconia and a cushion-cut centre stone for added volume. 9ct White Gold Cushion Cut Cubic Zirconia Shoulder Ring is rated 5.0 out of 5 by 6. Rated 5 out of 5 by Anonymous from Sparkly! I got this ring for my anniversary and it’s seriously so beautiful! it might be CZ but it looks like a real diamond! 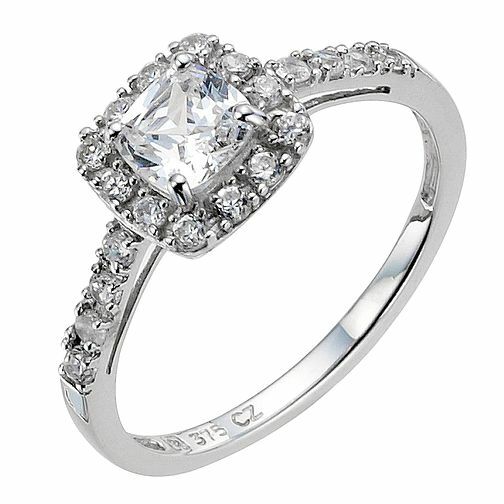 Rated 5 out of 5 by Anonymous from Very mch recommend Got it as an engagement ring, it's stunning. Looks extremely expensive. Love the details and very classy, quite vintage design. Never been massive fan of massive sparkle but this is a different kind of classy sparkle. Completely in love with it.